In this article I will try to explain how to build a “Dealer Locator” extension for Magento. This article is all about extension concepts, structure and planing and not the code itself. First we will start with scoping the feature. What functionality should it have? In our example, let’s imagine a client that wants a dealer locator to have “Search by nearest dealer based on ZIP/Postcode”, “Search by State”, “Search by dealer company name”. Search results should be displayed primarily on Google Map, plus it would be nice to have a table listing for those disliking the map visual style. If we extend this a bit further, we soon come to realisation that “dealers” themselves should be a customers in our Magento system. Justification for this lies in a fact that dealers should be able to do a regular purchases on our Magento store like any other customer just with special prices applied to products. Since customer in Magento has to have a customer group assigned to it, and products special pricing can be applied for each customer group. Thus all we need to do in order to “convert” dealers to customers is to create a customer group “Dealer” or even use “Wholesale” for these types of customers. Then on each product set a special price for that customer group, that is if the dealers will have special prices. Now, since dealers are just customers in our system then customer address(es) can be used for dealer locations. And this realization is the basis of our “Dealer locator” extension. Now that we have the general picture set, lets make a wireframe of the “Dealer locator” functionality. Once the wireframe is approved by the client we can start with the preparations for development. Now, if we look back at the original requirement: “Search by nearest dealer based on ZIP/Postcode”, “Search by State”, “Search by dealer company name” we can easily see that “Search by nearest dealer based on ZIP/Postcode” part will be the most challenging one. “Search by State”, “Search by dealer company name” are straightforward as this is the direct property of each customer address. 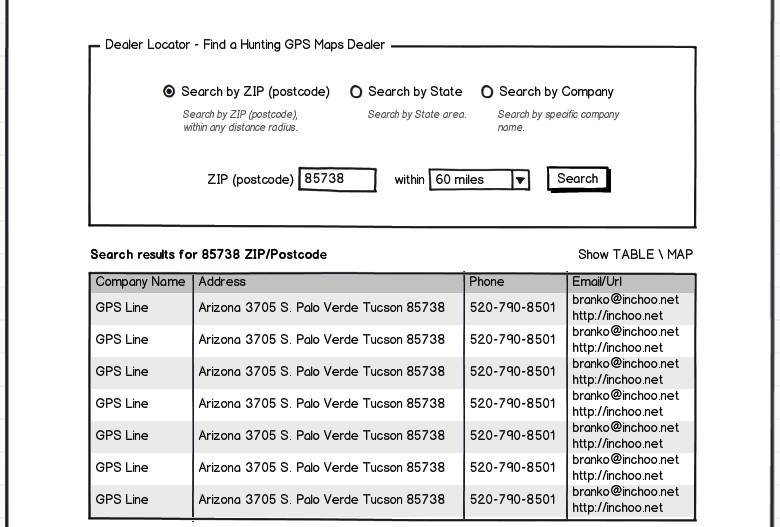 “Search by nearest dealer based on ZIP/Postcode” is something we will need to use certain calculations that involve geocode data. 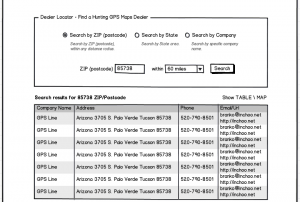 – Now we should have all pre-requirements for building the “Search by nearest dealer based on ZIP/Postcode”, we have latitude and longitude, we have distance. Please note the $saveCoordinatesToAddress variable. If we pack the code above into a separate method we can reuse it for live geo mapping of the provided “referencing ZIP/Postcode” as well. With the above in place you all that remains is to output the search results into the table or into the Google Map. There are plenty of example codes out there that show how to embed google maps with marker so I’m not going to cover this here. As mentioned at the beginning, the purpose of article is not to give a code ready solution but to give you an overview of the process that latter can then be given to developer so he can develop the feature. Hope you find it useful. Cheers. can it find automatically current location of user? Does this only work on Community edition or could it also be created for Enterprise? Cheers, this helped me build a search based on the location of a product. All comes down to addExpressionAttributeToSelect. Also, getSelect() is useful data to see! Thanks for sharing your thoughts Branko! Nice article, I’ve done similar things with ‘nearest result’ using the Maps API and WordPress. It can be a pretty powerful search tool in so many contexts.